Clarets boss Sean Dyche remains relaxed about the prospect of Joey Barton staying at Turf Moor beyond the summer. Barton, 33, signed a deal to the end of the season back in August, and has been influential in Burnley's push for promotion. He recently admitted his future at the club wasn't necessarily dependant on winning a place in the Premier League: "Not really. I’m enjoying my time here. Obviously it will depend on lots of factors. “If the club come and offer me a year now, as it stands, I’d definitely want to do it. “But the gaffer might be fed up of me in six months, you never know! “It’s been good. There’s no pressure on my side of it." 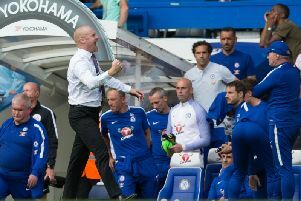 Dyche has a good relationship with the former Manchester City, Newcastle United and QPR man, and added:“Nothing’s impossible. But we’ve got plenty of time to talk about that. "He’s just enjoying what he’s doing I think. “I’m pretty sure he is, enjoying being in the culture and environment, he’s enjoying the group and enjoying being part of Burnley Football Club. “I think the rest of it takes care of itself over time. “I don’t think there’s any big talking point on that one.